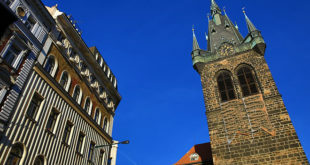 Attractions which you have to visit are: Charles Bridge, Old Town Square including Astronomical Clock, Prague Castle and possibly Jewish Quarter. Also worth consideration is the wonderful art nouveau confection, Municipal House with the largest concert hall in Prague. If you don’t visit them, you can’t honestly say you have been in Prague! All the other possible tourist sights can be considered based on your personal preference and time. For those who want to spend some time outside Prague we recommend you visit Kutná Hora or Karlovy Vary, or some of the dozens of castles and medieval farmhouses. These places can be easy reached and visited in one-day tours. 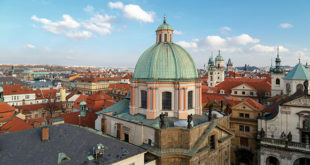 See Prague with a guide: guided walking tour. Our pick: a cruise on the Vltava River. The view of Prague from the river is a unique experience, as the historical centre is visible from a different perspective, presenting unusual prospects to the watcher. Romance: the second most romantic spot after Charles Bridge is Vysehrad. It is the place to relax. It is quiet; you don’t see many tourists there because it is not in the centre. You can visit the cemetery or the church or just walk in the park and enjoy the views. For a romantic evening you must attend a show at the Estates’ Theatre — it is so beautiful and well-preserved! And because it’s relatively small, you’ll feel as if you’re inside the most amazing music box. Tip: Krizikova fountain – great water and light show, or attend some great Mozart Operas. 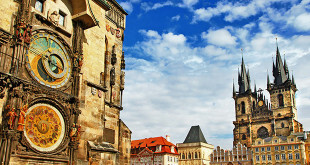 Here we list some of the attractions and sights of Prague. The list is certainly not complete, and it’s simply not possible to see everything, even if you stay a week. Prague Castle and St. Vitus Cathedral. This is the largest medieval castle in the world – the jewel of the Czech capital – and an enchanting large Cathedral. The castle contains an exhibition of Czech history and a collection of Bohemian art; the Prague Castle Gallery, Toy Museum, Powder Tower and Golden Lane are some of the places to see. Allow at least half a day. Old Town Square and the Astronomical Clock – in the heart of the Old Town surrounded by charming baroque, Gothic and rococo architecture, Old Town Square is a great place to hang around, have lunch at one of its many cafes, hire a horse or buggy, browse at market stalls or just look at the Astronomical Clock. Male namesti just a few steps away from Old Town Square was once home to Franz Kafka. 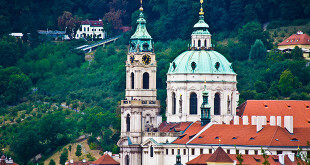 Don’t miss the Church of Our Lady Before Týn, the rococo Kinsky Palace, the medieval House at the Stone Bell and the baroque St. Nicholas Church. Charles Bridge – dating back to 1357 this bridge was built to replace Judith’s Bridge from the 12th century; now it is one of the most popular tourist spots in Prague, vibrant by day or night, scattered with vendors and entertainers. It offers some magnificent views especially early in the morning and around sunset. The Jewish Quarter Josefov – the oldest Jewish settlement in Europe, named after Emperor Josef II, consists of beautiful historic buildings comprising six synagogues. Discover the tragic part of Jewish history at the Jewish Museum. 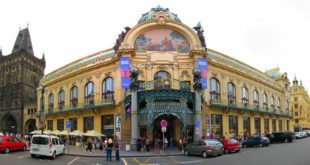 Municipal House – art nouveau palace built between 1905 and 1912 and the biggest concert hall in town (Smetanova Hall). Also don’t miss coffee at the fabulous Municipal House Kavárna. Lesser Quarter – this beautiful area was developed in the 13th century by merchants who set up shops at the base of the castle. Today the area is filled with restaurants, shops and foreign embassies. Visit St. Nicholas Church, which dates from the baroque period, or attend a concert, which usually starts at 17:00. Petřín Hill and Funicular – escape to the green, peaceful grounds of Petrin; visit the Petrin Observation Tower, the Observatory or just enjoy great views of the city. 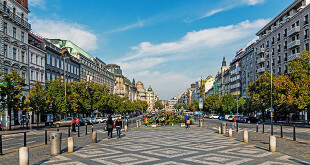 Wenceslas Square – symbol of modern Prague, shopping, art nouveau Cafe Evropa, St. Wenceslas Monument. Strahov Monastery – this imposing monastery was established in 1140 for the Premonstratensians. Visit the library, the baroque double-storey Philosophy Hall and Strahov Gallery. The Loreta is nearby – a pilgrimage site established by B.B. Katherina von Lobkwicz in 1626 (see replica of Santa Casa). Church of Our Lady Before Týn – fascinating interior with Gothic touches from the 14th century located at Old Town Square. Vyšehrad – once it was a forbidding fortress and now it is a popular place for locals during weekends. Visit the city’s oldest Romanesque rotunda, St. Martin, the Church of St. Peter and Paul. Enjoy a peaceful walk in the gardens. National Museum – the oldest museum in the Czech Republic has been hosting a vast natural history collection since 1891; exquisite interior. 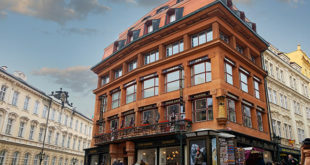 Don’t miss great views of Wenceslas Square from the upper floors. Rudolfinum – an imposing neo-Renaissance Czech concert hall hosting various programmes and festivals (Czech Philharmonic Orchestra).